So many homes across the land use antiquated devices like those old window-mounted mercury thermometers to monitor temperatures. And that rusty eyesore only shares a little bit of information compared to the information you could have. In this day and age of smart technology, there’s a much better way to get all your weather-related information – quickly and easily – from the palm of your hand. Here’s a smart device that will do just that. It’s called the Netatmo Weather Station | See On Amazon. It’s a complete weather monitoring kit for the budding meteorologist or weather buff. The Netatmo is a package consisting of two separate modules – so you’re covered for both indoor and outdoor conditions. 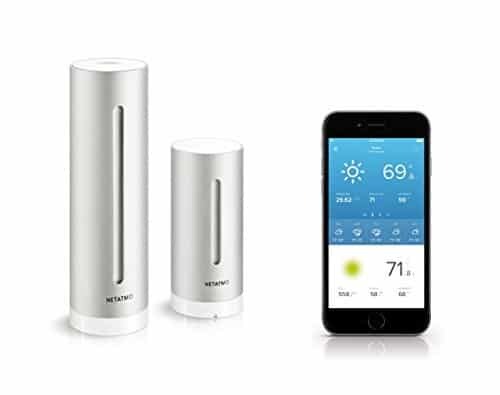 Netatmo Weather Stations are fully compatible with iPhone, Android and Windows devices – so you can connect wirelessly for up-to-the-minute information of interest for your indoor and outdoor environments. The Netatmo is a prime example of the convenience of state-of-the-art technology. Take the IFTTT channel for instance. 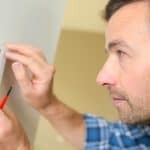 Currently there are 17 different triggers you can set up for a variety of conditions such as oncoming rain, rain no longer being detected, noise levels, carbon dioxide levels inside your home – just about anything. It’s useful information – delivered straight to your device. The weather station’s indoor module serves as a home base. This device should be plugged directly into the wall outlet and remain operational to continuously monitor and record the indoor conditions it experiences. Most of us spend more than three quarters of our time indoors, yet we don’t pay enough attention to the quality of the air we breathe. It’s time to pay closer attention and do what can be done to make the air inside safer to breathe. The mobile app is designed to give you access to your weather stations information from anywhere. That’s just another added feature of the Netatmo weather station that comes in handy when you’re away from home – whether it’s just across town or halfway around the world. Having this kind of access is a beautiful thing. 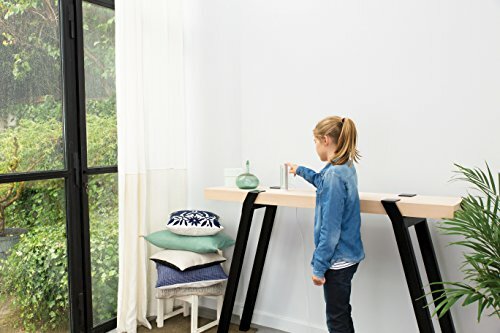 This cool Netatmo Weather Station sends you alerts when conditions deteriorate so that you can take necessary actions, like opening windows throughout to air out your home. At the same time, the outdoor station allows you to track and monitor local weather conditions so you can plan your outdoor activities accordingly. How cool is that? No longer are you relying on those often incorrect weather reports from local radio television. Instead, you’re getting accurate weather data that actually means something because those instruments are gathering their information from your exact location – not from dozens of miles away. You decide which conditions matter most to you and set up notifications. Then you simply go about your business, living your life. You’ll be notified accordingly – so you don’t have to keep an eye on things. And then you can take the appropriate actions. For example, should the humidity level rise indoors and create conditions where mold can thrive, you’ll be alerted. Additionally, you can be notified when rain is imminent, so you can change up your outdoor plans instead of getting caught off guard and drenched as a result. These are pretty slick devices. Both Netatmo Weather Station modules are gorgeous with their sleek, stylish, and innovative designs. What you get is essentially a one-piece aluminum design and cylindrical shape that looks as state of the art as it is. And it is extremely helpful in the information it provides. You can show it off to your friends and trigger their curiosity. Then you can blow them away with the kind of details those television meteorologists like to share. Geeky? Maybe to some people. But to those of us who take more than a passing interest in the changing environmental conditions, the Netatmo is a fun and informative instrument to own. Set up is relatively easy. But as with all new devices it’s best to study the instructions to get an overview before you start trying to figure it out yourself. Your base station serves as a central hub – so you’ll want to set it up first. It can then communicate wirelessly with all the other related sensors. The Netatmo Weather Station can give you a wealth of data to play with. There are so many ways you can use the Netatmo Weather Station modules. For example, you could use it to automatically shut off your automatic watering system when the skies open up and the rain begins. Or you could use it to monitor the impact of your indoor air as a landscaping crew works over your neighbor’s property, right next door. These are helpful devices that can serve in multiple ways. For the weather enthusiast, the Netatmo Weather Station makes a perfect gift. They can become your personal weather station for keeping tabs on both indoor and outdoor air quality and weather. You can also receive local air quality index reports in real-time. It’s the complete package. 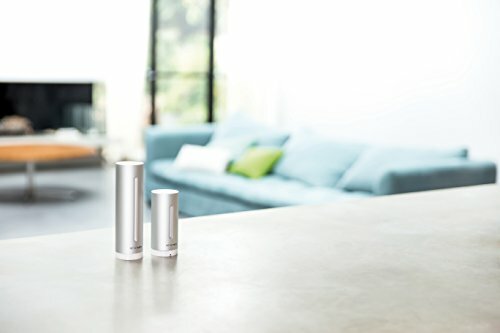 The Indoor module of the Netatmo Weather Station measures 1.8 inches by 1.8 inches x 6 inches high while the outside unit measures 1.8 inches by 1.8 inches by 4.1 inches high. Each housing is made of a single cylindrical piece of aluminum that’s UV resistant. You’ll want to protect the outdoor unit from rain and snow, however. The inside unit is powered by a USB wall adaptor (110 volts AC) that plugs directly into any standard wall outlet. The outside unit is wireless and powered by three AAA batteries that can last up to two years. You are covered by a one year warranty that’s included with your Netatmo Weather Station purchase. There are several additional sensors available at an added cost that make your Netatmo an all-in-one, complete weather station. The Wind Gauge and Rain Gauge are particularly important in rounding out the full set-up. You can also purchase additional indoor modules to keep tabs on air quality in different rooms around your house. There’s also an optional mount that makes it super-easy to set up your indoor and outdoor modules. It’s best to mount the outdoor unit in a protected area, like under an awning and high off the ground. Although it’s aluminum you want to protect its delicate sensors from the elements. Rain and snow even sun can cause inaccurate readings. For example, the rain can waterlog the device for several days after that rainfall has ended. The drier you can keep your outdoor station – the better and longer it should serve you. Another thing that’s cool about the Netatmo weather center is that you can pre-set various notifications regarding temperature, air quality, wind, rain, and more and push those notifications directly to your smart phone. This gives you the vital information you want in real time and places this key information right into the palm of your hand. Isn’t the latest technology a beautiful thing? 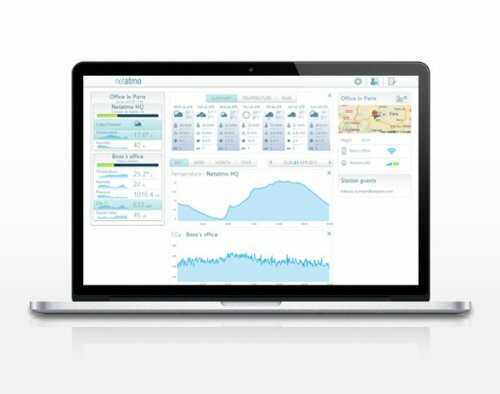 The Netatmo Weather Station uses about 20 MB of data per month on average. This is good to know and well under the capacity of most data plans these days. Each supplementary module that you add increases that consumption by about 2 MB every month. So one indoor and one outdoor station, plus the rain gauge and wind gauge would amount to about 24MB of data in total. It’s easy to set up notifications depending on weather related events. For example, you can get an alert when it’s starting to rain, or if there’s a strong wind. You can also be notified when there’s the probability of lightning in your area. It’s information that’s good to know – and crucial data for the resident weather buff. 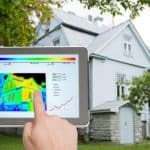 By adding multiple sensors and the additional accessories, you would essentially have a complete weather station right at your home. For a weather geek like me – this is an ideal scenario. It’s important to remember however that each additional sensor needs to be in range in order to be able to communicate with your weather stations home base. 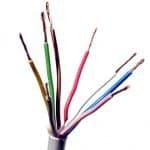 If you live in a large home (not a problem I’ve personally experienced) you may need additional sensors to tie your connection together instead of trying to cover the entire home from one end to the other with your components. Frankly, to get the maximum value from your weather station, you will want to be sure to add both the rain gauge and the wind gauge. 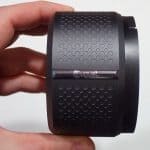 These additional sensors can double the purchase price overall, but it gives you so much more information and insight that’s it’s well worth it – in my opinion. These accessories makes it truly a complete weather station right at home. Is This Device Perfectly Accurate? No – it is not. No device is according to one meteorologist who is a big fan of the Netatmo Weather Station. All weather station equipment everywhere has some level of inaccuracy. That’s why measurements are considered over time rather than taking specific snapshots in many instances. The manufacturer states an accuracy level of ± 3% on humidity and ± 0.54°F in temperature – for example. It’s also important to note that the Netatmo weather station seems to only function with quality network equipment such as up-to-date routers. This is a “problem” with a lot of smart electronics. Older routers, for whatever reason, seem to cause problems as far as connectivity goes. That’s the same with any device you’ll need a solid and modern wireless network to get the most out of it. 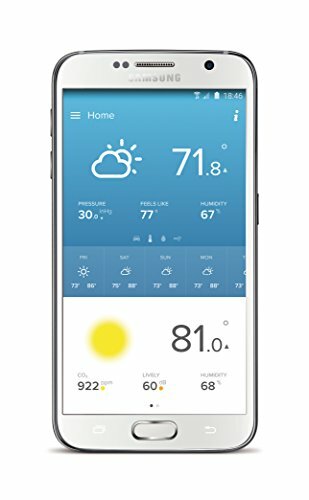 For anyone interested in their local weather – this is an excellent product. It easily handles the basic tasks of measuring temperatures indoor and outdoor and all related environmental conditions. It also provides a graphical history of highs and lows for both indoor and outdoor. This in itself can be quite revealing. For most of us, weather conditions are something we take an interest in and adapt to. The Netatmo just makes it a whole lot more fun to do so.